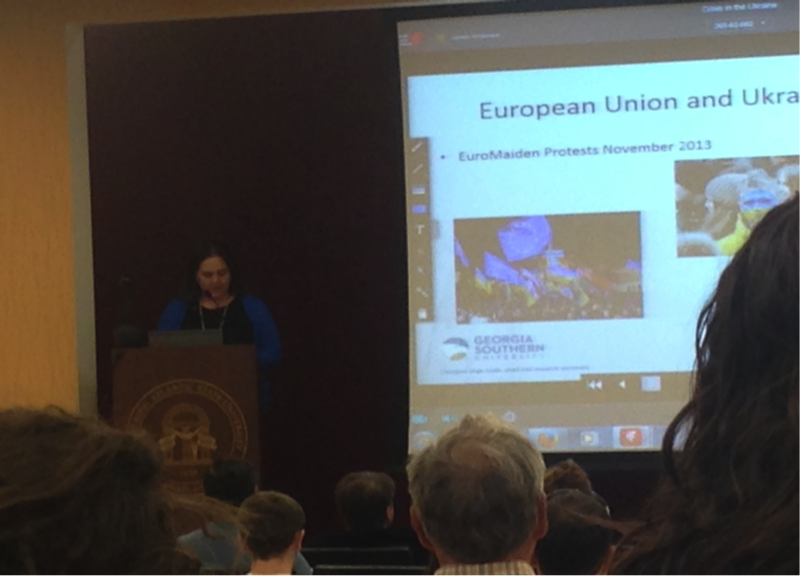 Students gathered on Oct. 16 for the Ukraine Crisis Symposium held in the Ogeechee Theater. The event, hosted by the Savannah Council on World Affairs, saw a healthy turnout of students all wanting to hear what each of the five panelists had to say on the current crisis. Each speaker gave a ten minute presentation on topics ranging from Russia’s view of the current crisis to NATO’s (the North Atlantic Treaty Organization) involvement. The quick and to-the-point presentations were followed by an engaging Q&A between students and the panelists. “This is one of those thorny items that affects the whole world,” President Linda Bleicken said in her opening speech. It is easy to understand why a European conflict might not affect the US and especially Savannah directly; however, the Crisis in Ukraine affects us at Armstrong in the same way other current events such as the ebola outbreak in West Africa and the ISIS conflict in the Middle East do. They mess with our economy and are particularly important for locals who may have family in these places. Jacek Lubecki, a native of Poland and a Political Science professor at Georgia Southern University, kicked off the symposium with his presentation “What is Ukraine?” where he discussed the segregation in Ukraine and how it has affected the country. From the brief presentation it was clear that much of the issues today have stemmed from the fact that Ukraine “has a weak sense of statehood” according to Dr. Lubecki. “I still feel unaware of the actual crisis,” said student Georgia Smith on whether she felt more informed as a student about the Ukraine Crisis after the panel discussion. Campus events such as Spring Fling, the Annual Beach Bash and more recently, Celebrate, often come with the hype to engage students. Why is it that serious educational events such as the Crisis in Ukraine Symposium weren’t given the same hype? It is not unusual to hear students debating foreign affairs during their breaks on campus. There is a lot happening throughout the world right now, and it is refreshing to see the Armstrong community taking an interest in issues beyond the local and national community. Perhaps with more panel discussions on a range of foreign affairs, not just the politically fueled events, a wider range of students will be in attendance.